Fantasy at its finest, the world that George R. R. Martin has created in the A Song of Ice and Fire series is rich and complex. Each character feels fleshed out, each act feels perfectly planned. The books have become an HBO series, and together they still capture the attention of readers and audiences both. 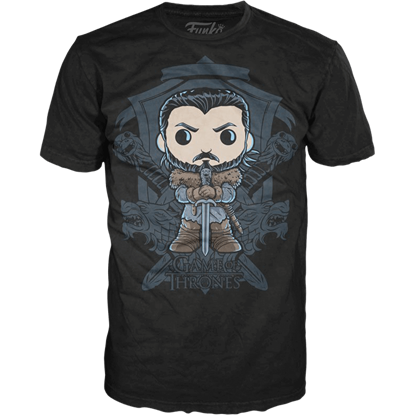 And now, we have joined in on the craze with a selection of Game of Thrones apparel. Like many of our t-shirts, all of our Game of Thrones apparel is all made from the finest fabrics, ranging from quality cotton to fabric blends, all to offer the most comfortable fit as possible. More than that, though, our shirts also feature the iconic emblems that fans have come to expect out of Westeros. If you align with any of the noble houses, you can find their logo here, ranging from the Lannister lion to the Stark direwolf, from the Baratheon stag to the Targaryen dragon, all on quality tees for you to wear and enjoy. Memorable quotes and characters make an appearance too, enhancing the graphics that are printed on these quality t-shirts. We also offer a few other pieces of apparel in this section, including hoodies and jackets, to help you stave off the winter cold with quality garments that show off a distinctive Westeros style! Whether you are a Lannister loyalist or a Stark supporter, you can certainly expect to find the Game of Thrones garments that you want to wear right here! If you are going to support a noble family in Westeros, then you should support them whole-heartedly. 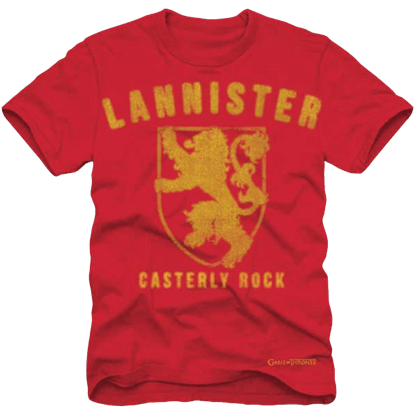 This Casterly Rock Game of Thrones T-Shirt looks somewhat like a sporting tee, allowing any fan to show their loyalty for the lion. 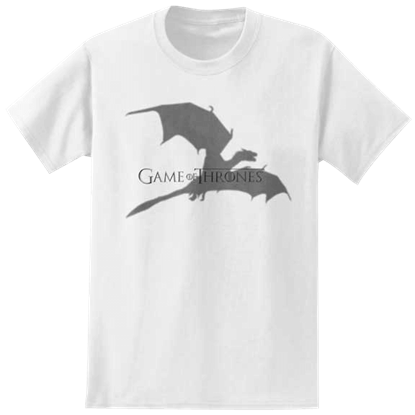 A wonderful way to express your love of this instant classic, the Game of Thrones Dragon Shadow T-Shirt features a simple design of a dragon profile on a white shirt with the title of the show printed across its center. Involved in a dangerous game of vying for the throne of the 7 Kingdoms of Westeros, several Houses claim rights to this highly sought after power. 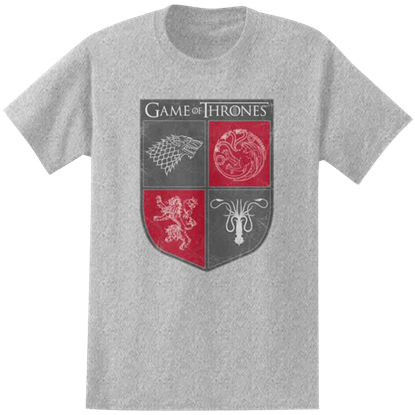 The Game of Thrones House Sigils T-Shirt displays 4 crests of these power hungry Houses. The game for the Iron Throne has only just begun. You do not wait for a House or a warlord to lay claim to it, though. 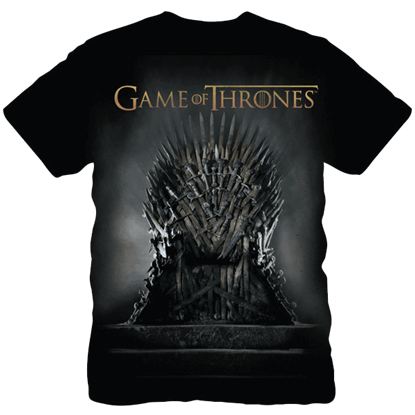 Instead, you can claim it for your own by wearing this Game of Thrones Iron Throne T-Shirt! Winter is coming. Luckily, it will not last years like it does in Westeros. 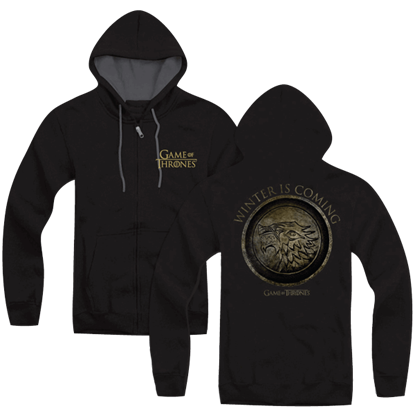 Still, it is a good idea to bundle up, and with this Game of Thrones Zippered Hoodie, you can keep warm while showing some support for your favorite TV series! 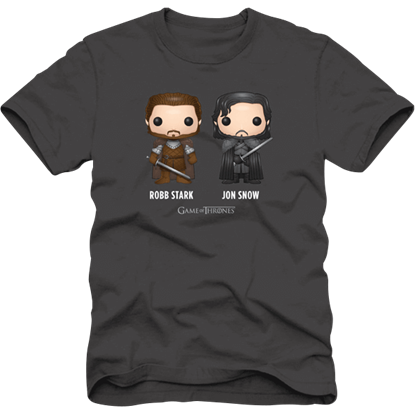 Displaying an image of the two eldest sons of Eddard Stark from the Game of Thrones series, the GoT Robb Stark and Jon Snow T-Shirt is a fantastic shirt for anyone who supports the noble and honorable ways of House Stark. 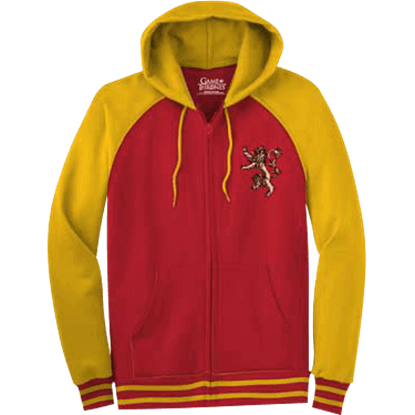 Featuring an eye catching design which is inspired by the tales of Westeros, the Hear Me Roar Lannister Hoodie is a superb way for fans of the Game of Thrones series to display their support for the Lannister claim to the throne. When it comes to A Game of Thrones, there are many characters to love, from many different noble houses. 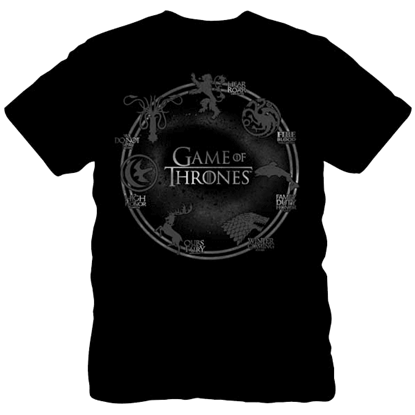 Luckily, you do not have to choose only one - not when you can instead wear this House Sigil Game of Thrones T-Shirt! When in Westeros, do as the Westerosi do! That means picking a side in the conflict that embroils the land. 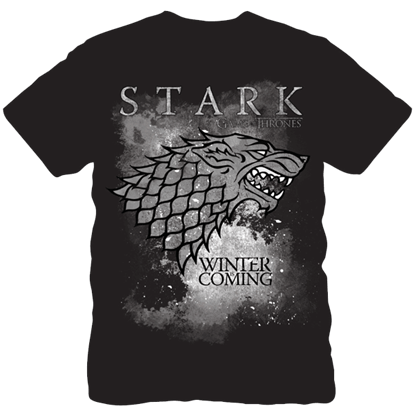 If you chose House Stark, nothing shows your support quite as well as this appealing House Stark Game of Thrones T-Shirt. The ruling powers in Westeros are divided up by noble families. Among them are the Starks, who rule in the North. 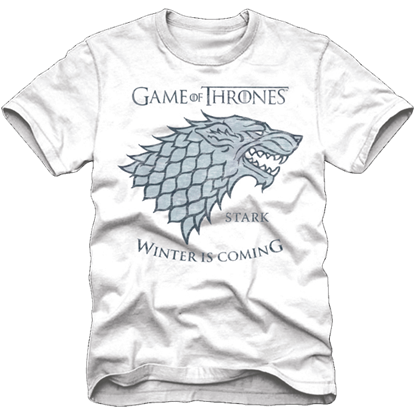 This House Stark White Game of Thrones T-Shirt allows you to show this noble family your allegiance by wearing their sigil. We would not fault you if you told us that your favorite Game of Thrones character was Jon Snow! Instead, we would tell you about the Jon Snow Crest POP T-Shirt. Our favorite king in the North is front and center in POP! fashion! 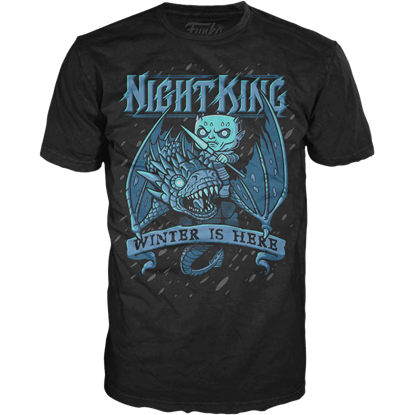 Having resurrected the dragon Viserion after the Battle Beyond the Wall, the blue-skinned Night King rides his new mount into battle on the Kings Ice Dragon POP T-Shirt. No man is safe while this fearsome duo rules the skies.